When you're installing a new bathroom, getting the right shower will mean the difference between high-pressure jets of water and a lukewarm trickle. Read this expert guide from Steve Saunders, technical manager at Triton, to discover the main types of shower available, and which is best suited to your home’s water system. Before you even start to think about the type of shower enclosure or shower head you need, get to know your bathroom's plumbing and water heating systems. Unless you are willing to upgrade, you may be restricted by what is already in place, eliminating some of the options. Quick and easy to install, electric showers draw on a cold-water supply and heat the water on demand so you can jump in at any time of day. They’re also extremely economic – up to 99.7 per cent energy efficient – as the cold water is heated by an element, providing hot water instantly, with no wastage. The higher kilowatt rating you choose, the better the flow will be. Mixer showers draw from both hot and cold water supplies and usually deliver higher flow rates. The shower works by mixing hot and cold water within the unit and then delivering it through the showerhead, which can be fixed, adjustable, or as a handset on a riser rail. They’re ideal for homes with readily available hot water, such as a combination boiler or large-capacity hot-water cylinder. If required, a pump can be added to a low-pressure, gravity-fed hot water system to increase water pressure. Once you have set your ideal temperature, thermostatic electric and mixer showers will automatically ensure this remains virtually constant – even if someone turns on a tap elsewhere in the house. Although temperature-stabilised electric showers provide adequate temperature control for most homes, the demand for thermostatic peace-of-mind is growing, particularly if children or elderly people need to be taken into account. Eco showers limit the flow of water to an efficient, usable level no matter what your household pressure system, whilst maintaining your selected temperature. Available in both electric and mixer variations, they can offer up to 50 per cent reduction in water usage when compared to conventional mixer showers. 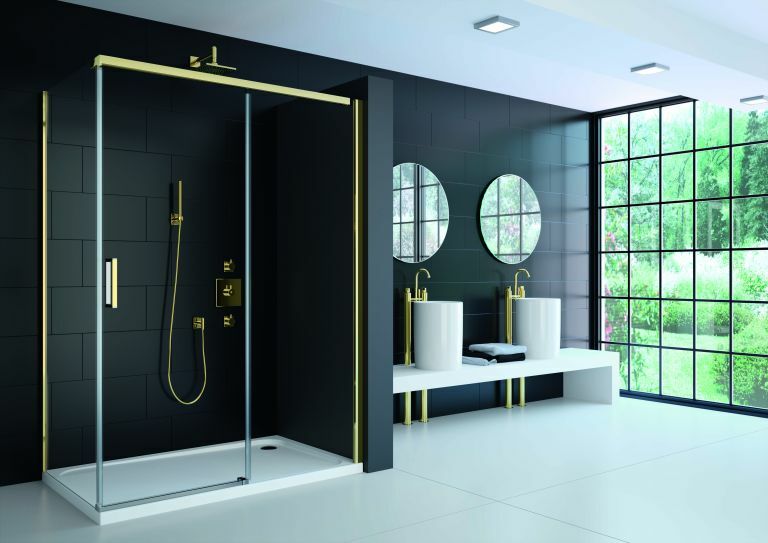 Available in either mixer or electric variations, digital or remote control showers are an increasingly popular choice as they offer a combination of state-of-the-art bathroom technology, stylish design and ease of installation. The shower is controlled by a panel, which can be located within a 10-metre radius, giving you more freedom in your bathroom layout. The panel then communicates with the power unit, located either in the loft or airing cupboard, to adjust the flow and temperature of the water. Water at a preferred temperature is then delivered through the ceiling or wall to the showerhead, and there is no unsightly plumbing visible. If you have a hot water tank, usually located within an airing cupboard, but don’t have a cold water tank in your loft, then you have an unvented high-pressure system. This can look similar to a low-pressure system, so always check to avoid any confusion. If you have a combination boiler, which heats water on demand so there is no hot water storage cylinder or cold-water tank, then you have a high-pressure system. If you have a cold-water tank in your loft and a hot-water tank in your airing cupboard, then you have a gravity-fed system. It’s the most common household plumbing system and means that you have a low-pressure water system. Having low pressure need not limit your choice of shower type – power showers are designed to offer optimum performance within a low-pressure scenario. And if your hot water cylinder is large enough, you could choose to boost your system pressure with a pump, which can enable you to have a mixer shower, if you desire. If cold water comes into your property through a rising main then you have a cold mains system. Most electric showers can simply be connected to a cold water mains supply – all you need to do is choose a style to suit your bathroom scheme. However, if your cold mains water supply does not have the required minimum pressure for such showers, a tank-fed, pumped electric shower would be a good choice. Whether your shower will be over the bath, in a wet room, or in its own cubicle, there are a few choices. Some bath taps come with a shower head attached. You can get a rail to hold the head, but they are often fitted as part of a freestanding bath, perhaps away from a wall and intended to be hand held. As such, they are generally best for those who prefer to sit in the bath and rinse their hair, and are also good for bathtime for those with young children. This type of shower head (as the name suggests) is fixed through the ceiling or on an arm from the wall. Generally the shower rose will have one flow pattern (although some may be adjustable) and they are often found in wetrooms. For versatility, you may pair it with a handheld shower head, and switch between the two during use – although some can be operated at the same time. They are sometimes referred to as rainfall, or rainforest showers and can offer a really luxurious showering experience if high-pressure. Handheld showers tend to have a head that can offer both jet and spray options for varied use. They are also offer better reach and flexibility than fixed shower heads. Don't worry, you won't have to hold it for the length of your shower – they can be paired with a wall-mounted slider rail kit. If you’re still unsure which type of shower is best you, take a look at Triton’s Shower selector tool.